LOS ANGELES – Marcia Wallace, who created two classic TV roles on “The Bob Newhart Show” and “The Simpsons,” passed away in Los Angeles, according to her agent on Saturday. She was 70 years old. In the 1970s, she was known as Carol Kester, Bob Hartley’s assistant on that Newhart show. In 1990 – one season after “The Simpsons” began – she took on the voice role of Edna Krabappel, the frazzled and man-hungry fourth grade teacher of Bart Simpson. Marcia Karen Wallace was born in Creston, Iowa, and began her theater career in college. The day she graduated she headed to New York City with $150 dollars in her pocket and a dream to be an actor. It was that semi-regular status on that talk show that got her the audition for her first recognizable television role. The Chairman of the CBS-TV network, William S. Paley, saw Wallace on the Griffin show, and personally invited her to appear as Carol Kester on “The Bob Newhart Show.” She was with the show for all six seasons. During the Newhart run, Wallace also did guest roles on “The Brady Bunch,” “Bewitched” and afterward on “Charles in Charge,” “Murder She Wrote,” “Full House” and “A Different World.” She began her second most familiar role in 1990, as the voice of Edna Krabappel on “The Simpsons,” and remained with that semi-regular character to the present day. Click here for the full 2010 HollywoodChicago.com interview. Source material for this article came from the Wikipedia and CNN.com. 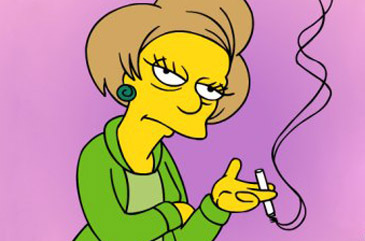 Marcia Wallace, 1942-2013.